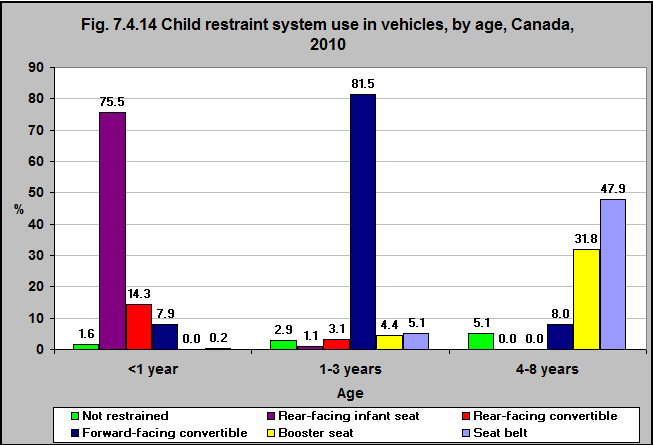 Source: CICH graphic created using data adapted from the Canadian National Survey on Child Restraint Use 2010. Transport Canada, in partnership with AUTO21. https://www.tc.gc.ca/media/documents/roadsafety/Child_Restraint_Survey_2010.pdf – accessed June 24, 2017. According to the Canadian Survey on Child Restraint Use 2010, 90% of infants were in a rear-facing seat in 2010. 82% of 1 to 3 year olds were in a forward-facing convertible seat. 32% of children 4 to 8 years were in a booster seat, 48% were in a seat belt and 5% were not restrained. 8% were in a forward-facing convertible seat. 1Snowdon, Anne W., Hussein, A and Ahmed, E. (2010). Technical Report: Canadian National Survey on Child Restraint Use 2010. Completed for Transport Canada, in partnership with AUTO21. https://www.tc.gc.ca/media/documents/roadsafety/Child_Restraint_Survey_2010.pdf– accessed June 24, 2017. 1Transport Canada. 2001. Canada’s Road Safety Targets to 2010. http://publications.gc.ca/collections/Collection/T46-28-2001E.pdf – accessed June 24, 2017. 2Transport Canada Motor Vehicle Safety (with support from the Public Health Agency of Canada). 2011. Road Safety in Canada. https://www.tc.gc.ca/eng/motorvehiclesafety/tp-tp15145-1201.htm#s31 -accessed June 24, 2017.